I just received the newest release, Live At Blues Now! from the Chris O'Leary Band and it has a super groove. This release was recorded live in Basel, Switzerland in March of 2014. Opening with Give It, a one-chord modal blues structure with a repeating guitar figure and Diddley-style rhythm, O'Leary leads the way into this live set on vocal and harp. Joined by Chris Vitarello and Alex Schultz on guitar, Andy Stahl on tenor sax, Chris DiFrancesco on bari sax, Matt Raymond on bass and Jay Devlin on drums this band is tight. On jump track, Trouble, the band ramps it up with Schultz laying down some hot smokin' guitar work. O'Leary cranks it up as well with a mighty solo of his own. Very nice! Louisiana Woman has a swampy sound with a nice bass lead from Raymond. Cool shimmery guitar effects from Vitarello as well as a soulful guitar solo and the masterful harp work from O'Leary make this a really cool track. R&B style track Walk The Walk really invites the horn work of Stahl and DiFrancesco. A thick and juicy sax solo from Stahl and aggressive guitar work from Vitarello highlighted by the tight drumming of Devlin. Water's Risin' is a funky rocker with Vitarello and Schultz trading bluesy chicken pickin' style guitar solos. Billy Boy Arnold's I Wish You Would is a perfect showcase for O'Leary on harp. With solid sax work and complex drum rhythms this track has a life of it's own and even a little tribute to Lee Oscar. Mr. Used To Be has a western style blues swing but with sax instead of steel guitar giving it a totally different flavor. O'Leary lays down a real nice harp solo on this one proving to be a real crowd favorite. 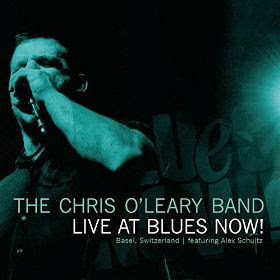 My favorite track on the release, Blues Is A Woman, slows it way down and O'Leary really does a hot job on lead vocal. Vitarello plays heavy T-Bone Walker stylized riffs making this track seven plus minutes particularly memorable with DiFrancesco and Stahl giving the track heft. Excellent! King of The Jungle has a real nice lope and with it's Chicago style, gives O'Leary a great chance to play his harp out. Vitarello lays in a few real nice riffs tying it all up. Tchoupitoulas has a real cool New Orleans sound and DiFrancesco really adds bottom. The sax work on this track is over the top and complimented with sly guitar riffs and marching drum style so I really do like it! Waiting For The Phone To Ring opens with some great bari sax and a great story telling style. Overlayed sax and guitar riffs make this one of my favorite tracks on the release. Wrapping the track is History, which has a great new Orleans funk feel. This is a groove that you have to love. Clocking in at 9 plus minutes, this is a New Orleans style lovers dream. Filled with excellent guitar, harp and sax work, this is a super way to wrap up a fine concert recording.